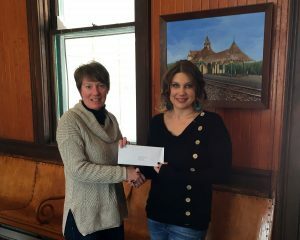 Cloudsplitter Foundation Director Chenelle Palyswiat (R) presents Depot Theatre Executive Director Kim Rielly with a check for $4,000. Westport, N.Y. — The Depot Theatre has been awarded a $4,000 grant from the Cloudsplitter Foundation for capital improvements to its artist housing. As a professional theatre operating under an agreement with Actors’ Equity Association, the Depot is required to provide housing for its visiting artists who work at the theatre during its summer main stage season. The Cloudsplitter Foundation funds will be used toward improvements to the Depot-owned facilities, allowing the theatre flexibility to expand programming into the winter months. The Depot Theatre a non-profit, professional theatre located in a functioning, circa 1876 train station in Westport, New York. For more information about the theatre, visit www.DepotTheatre.org. The Depot Theatre is a non-profit, professional theatre located in a historic, functioning 1876 train station in Westport, N.Y., and operates under an agreement with Actors’ Equity Association, the union of professional actors and stage managers in the United States. In addition to its volunteer board of trustees, the theatre depends on the support and generosity of its loyal donors, volunteers and community members. Committed to promoting and providing exposure to the performing arts in the Adirondacks, the Depot Theatre invites all to “Take a journey without leaving the station.” The Depot Theatre’s 2019 Season is made possible by the New York State Council on the Arts with the support of Governor Andrew Cuomo and the New York State Legislature. The season productions are made possible, in part, by the Essex County Arts Council’s Cultural Assistance Program Grant with funding provided by Essex County. The Depot Theatre’s 2019 Season is sponsored by the The Brooks and Joan Fortune Family Foundation. Westport, N.Y. – The Depot Theatre in Westport on Lake Champlain is pleased to announce the appointment of Angel Marvin as its full time Associate Director/Company Manager. The added full time position is made possible in its initial year with funding via a New York State Council on the Arts (NYSCA) workforce development grant, the result of a successful Regional Economic Development Council (REDC) Initiatives Consolidated Funding Application (CFA). The new associate director/company manager will be responsible for coordinating administrative activities related to human resources and company management, finance and development. Marvin possesses both extensive development experience and a love for theatre. An Elizabethtown native, Angel has gravitated professionally toward community-oriented non-profits for most of her career. 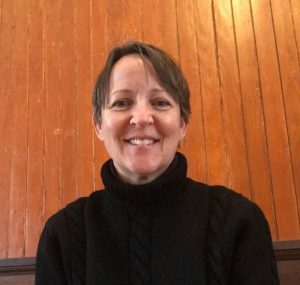 Her 17 years’ experience in proposal writing and grant administration, project management and planning include past posts at the Nature Conservancy, Lake Placid Connecting Youth and Community and the Village of Lake Placid/Town of North Elba. Marvin worked most recently as a Leadership Gifts Officer at Vassar College, her alma mater. She has performed in or directed 21 community theatre productions in Lake Placid and the Champlain Valley as well as, years ago, appearing in two professional shows at the Depot. The theatre recently announced its 2019 main stage season, which begins on June 28. For more information about the Depot Theatre, visit www.depottheatre.org. 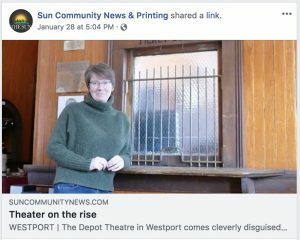 Westport, N.Y. — The Depot Theatre in Westport on Lake Champlain has been awarded funding by the New York State Council on the Arts (NYSCA) in the amount of $26,250. The award is the result of a successful Regional Economic Development Council (REDC) Initiatives Consolidated Funding Application (CFA) for fiscal year 2018-2019. NYSCA also supported the Depot Theatre with a multi-year general-operating support grant of $15,000 per year for each 2018 and 2019. And, in 2017, the Depot Theatre replaced the seating and carpeting in its 134-seat theatre. The seating project was funded in-part by a facilities program grant from NYSCA. The new funding, a workforce development grant, will allow the theatre to add a full time staff position. The new associate director/company manager will be responsible for coordinating administrative activities related to human resources and company management, finance and development. The theatre just announced its 2019 main stage season, which begins on June 28. For more information about the Depot Theatre, visit www.depottheatre.org. Westport, N.Y. — The New York State Council on the Arts (NYSCA) has increased its commitment to the Depot Theatre with a grant of $15,000 per year for each of the next two years. 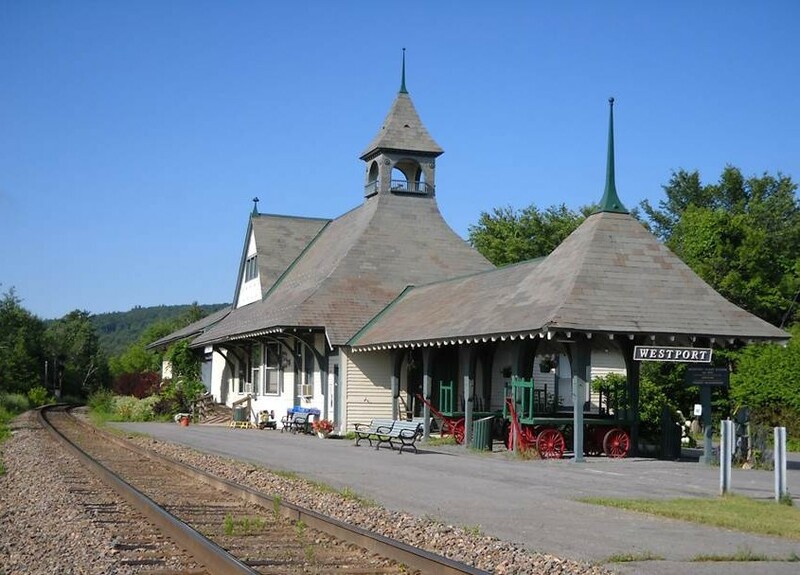 The multi-year general-operating support grant is the largest NYSCA award to the Depot in eight years. NYSCA grants are awarded in 15 programs and the Regional Economic Development Council initiative in all 62 counties to support the creation of visual, performing, literary and media arts. The Depot Theatre is one of seven non-profit arts organizations (including two theatre companies) in Essex County to receive funding this year. In 2017, the Depot Theatre replaced the seating and carpeting in its 134-seat theatre. The project was funded in-part by a facilities program grant from NYSCA. The Depot Theatre’s 2018 Season, its 40th, is made possible by the New York State Council on the Arts with the support of Governor Andrew Cuomo and the New York State Legislature. The Depot Theatre is a non-profit, professional theatre located in a historic, functioning 1876 train station in the Adirondacks, and operates under an agreement with Actors’ Equity Association. Celebrating its 40th anniversary season in 2018, the theatre currently offers 3-4 productions in the summer along with educational outreach programs. For more information about the Depot Theatre, visit depottheatre.org or call 518.962.4449. The Depot Theatre is a non-profit, professional theatre located in a historic, functioning 1876 train station in Westport, N.Y., and operates under an agreement with Actors’ Equity Association, the union of professional actors and stage managers in the United States. In addition to its volunteer board of trustees, the theatre depends on the support and generosity of its loyal donors, volunteers and community members. Committed to promoting and providing exposure to the performing arts in the Adirondacks, the Depot Theatre invites all to “Take a journey without leaving the station.” The Depot Theatre’s 2018 Season, its 40th, is made possible by the New York State Council on the Arts with the support of Governor Andrew Cuomo and the New York State Legislature. Additional support is provided by the Essex County Arts Council. The Depot Theatre, a not-for-profit organization committed to providing professional theatrical arts in the Adirondacks, has received a grant for theatre improvements from the Alfred Z. Solomon Charitable Trust. The Alfred Z. Solomon Charitable Trust has awarded the Depot with a grant of $6,710 to replace the theatre’s aging lighting grid. “The new lighting grid will improve and expand the theatre’s technical capabilities for our designers and technicians,” said Kevin Cochran, the Depot’s Producing Director. The grant provides half of the funds for the project, of which the remainder will come from the theatre’s recent theatre improvement fundraising campaign, which began last summer. The goal of the campaign is to raise funds for infrastructure improvements including new seats, new carpeting, aisle lighting, expanded WiFi service and other projects. “Improvements such as these allow us to fulfill our mission of producing professional theatre for our community,” said Erin Harrington, business manager at the Depot. “We are so pleased that the Alfred Z. Solomon Charitable Trust has decided to support this important project,” said Amy McNamara, president of the Depot Theatre Board of Trustees. Donors to the theatre improvement campaign include numerous individuals from the community, the Charles R. Wood Foundation and the New York State Council on the Arts. For more information about the Depot Theatre, visit depottheatre.org. The Depot Theatre is a non-profit, professional theatre located in a historic, functioning 1876 train station in Westport, N.Y., and operates under an agreement with Actors’ Equity Association, the union of professional actors and stage managers in the United States. In addition to its volunteer board of trustees, the theatre depends on the support and generosity of its loyal donors, volunteers and community members. Committed to promoting and providing exposure to the performing arts in the Adirondacks, the Depot Theatre invites all to “Take a journey without leaving the station.” The Depot Theatre’s 2017 Season, its 39th, is made possible by the New York State Council on the Arts with the support of Governor Andrew Cuomo and the New York State Legislature. Additional support is provided by the Essex County Arts Council. The Alfred Z. Solomon Charitable Trust (Saratoga Springs, N.Y.) was established to benefit nonprofit scientific, medical, educational, cultural, religious, and charitable organizations by funding project and programs in memory of the Trust’s founder, Alfred Z. Solomon. Mr. Solomon, a leader in the fashion industry, a horse racing enthusiast, and a philanthropist in Gansevoort, N.Y., and New York City, died on Sept. 4, 2004, at the age of 104, and founded the Trust in his Last Will and Testament. Maureen Carlo, Jim Carroll, Alisa Endsley, Beth Glover (secretary), David Howson, Daniel Keegan, Lawrence Masle, Amy McNamara (president), Diana McGuigan, Cheri Phillips, Kathy Recchia (vice president), Kimberly Rielly (treasurer) and Shirley Bacot-Shamel. Bobbi Atz, Linda Beane, Bonnie Brewer, Randy Buck, George Davis (honorary chair), Howard Fish, Jonathan Hadley, John Klipper, Karen Lewis, Michael McDonald, Mary Ellen O’Loughlin, Libby Pataki, Jane Preston, Annie Scavo, Sally Struthers and Michael Thomas. The Depot Theatre, a not-for-profit organization committed to providing professional theatrical arts in the Adirondacks, has received grants from the New York State Council on the Arts and the Charles R. Wood Foundation to improve infrastructure which will enhance the patron and artist experience. The New York State Council on the Arts (NYSCA) has awarded the Depot with a matching-grant of $16,653 to replace audience seating and carpeting in the 140 year-old building. The new seats will replace the existing 60+ year-old seats which are difficult to maintain and for which replacement parts are obsolete. New commercial grade tile carpeting will be installed throughout the seating area, as well. “While there is a nostalgic fondness for the existing seating, we believe our patrons deserve to experience professional theatre in modern comfort. And, NYSCA agrees!” said David Howson, president of the theatre’s Board of Trustees. The matching-grant, which is in addition to $6,000 in annual operating support from NYSCA, will also provide for dedicated accessible and companion seating sections for patrons with disabilities. The theatre will begin a campaign this summer to raise the matching funds and installation of the new seats is anticipated to be completed before the opening of the theatre’s 39th season in 2017. The Trustees and Staff of the theatre are grateful to NYSCA and the Charles R. Wood Foundation for their support. For more information about the Depot Theatre and the 2016 season, visit depottheatre.org. The Depot Theatre is a non-profit, professional theatre located in a historic, functioning 1876 train station in Westport, N.Y., and operates under an agreement with Actors’ Equity Association, the union of professional actors and stage managers in the United States. In addition to its volunteer board of trustees, the theatre depends on the support and generosity of its loyal donors, volunteers and community members. Committed to promoting and providing exposure to the performing arts in the Adirondacks, the Depot Theatre invites all to “Take a journey without leaving the station.” The Depot Theatre’s 2016 Season, its 38th, is made possible by the New York State Council on the Arts with the support of Governor Andrew Cuomo and the New York State Legislature. Additional support is provided by the Essex County Arts Council. Maureen Carlo, Jim Carroll, Alisa Endsley, Beth Glover (secretary), David Howson (president), Lawrence Masle, Amy McNamara (vice president), Diana McGuigan, Cheri Phillips, Kathy Recchia, Kimberly Rielly (treasurer) and Shirley Bacot-Shamel. The Depot Theatre receives funding from the New York State Council on the Arts with the support of Governor Andrew Cuomo and the New York State Legislature. Get the latest Depot Theatre News!